If you’ve ever stayed at a Walt Disney World Resort, you know how wonderous it is to be surrounded by the magic 24 hours a day while on vacation. At Disneyland, it is just as magical. Being in the “Disney Bubble” adds a huge dose of pixie dust to your trip. If you’re on a budget, (and who isn’t? ), you’ve probably chosen the value or possibly moderate resorts. They offer tons of fun, all the perks of staying on property, and still let you manage to have some money left over for a Dole Whip or two! But have you ever dreamed of staying in a deluxe resort? Ever wondered what it was like to stay on the monorail loop, or wake up gazing out over the savannah to see giraffes enjoying their breakfast? Have you longed to enjoy the famous lazy river at Stormalong Bay, but just knew it was out of your budget? There may be a way to make your dreams come true! Disney Vacation Club offers marvelous accommodations at the deluxe resorts, and there’s a way you can enjoy those rooms WITHOUT being a DVC member. 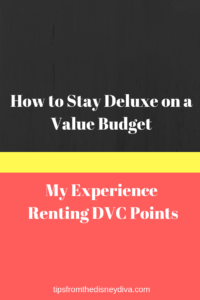 We’ve been checking deluxe resorts off our Disney Bucket list for a couple of years now, and it’s all thanks to renting DVC points. 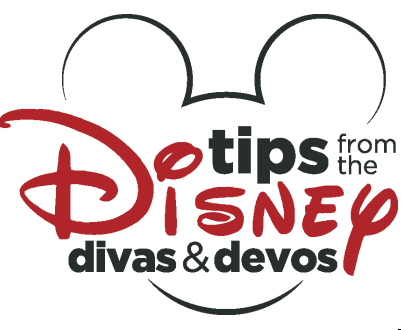 Diva Tip: If you are interested in learning more about DVC membership, I’d encourage you to speak with a DVC cast member. You can find a DVC booth at all the parks and deluxe resorts. You can sign up to attend a DVC informational workshop and take a tour. You may even qualify for a Disney gift card and/or extra FastPasses to compensate you for your time in attending. My husband has attended twice and earned a $100 gift card each time! When, for whatever reason, members don’t need the points they have for a certain year, they can choose to rent them to non-members. There are various third-party brokers which will handle the transaction for you. You can also rent directly from DVC members you may know or meet through various chat boards. Our family has rented points twice through David’s Vacation Club Rentals, and we’ve LOVED how easy it can be! 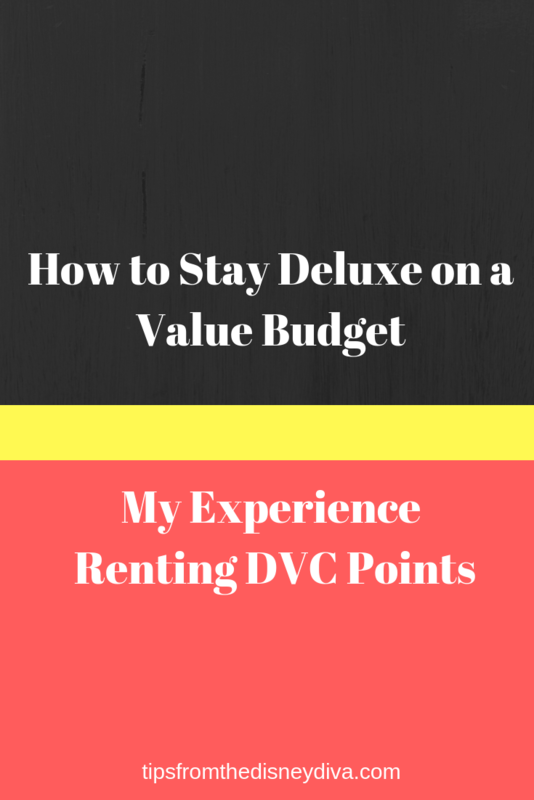 (DevoCab Disney has used The DVC Rental Store – be watching for reviews of his experience too!) If you’ve ever wondered if renting points may be right for you, keep reading! Diva Tip: If you have a large family, or are traveling with a group, renting points may be especially appealing. 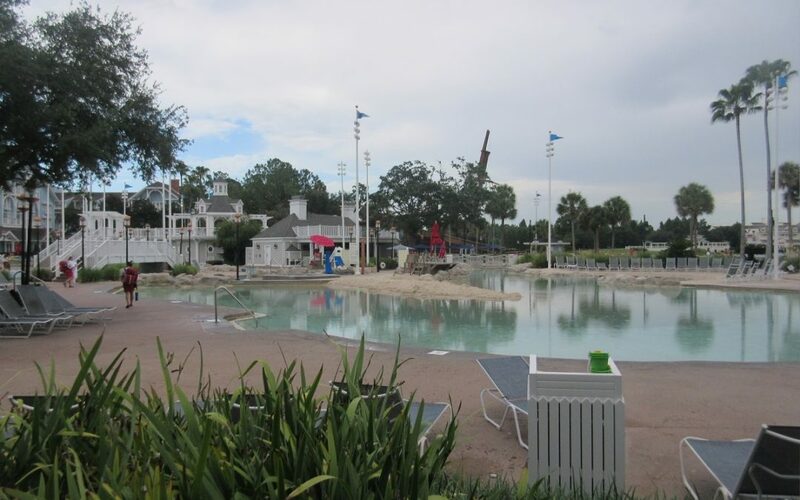 In addition to studios which sleep 4 or 5, DVC resorts offer 1 or 2 bedrooms and even grand villas which sleep up to 12! Additionally, these villas have kitchens and washer/dryers so it’s truly like a home away from home. We’d heard about renting points as a way to make staying at a deluxe resort more affordable, but frankly we were a little leery. What if something went wrong? Can we still use Magical Express? Have Magic Bands? Make advanced dining reservations? Can I see the reservation in My Disney Experience? It just was a little too “unknown” for our comfort zone. Choose your travel dates. Once you have some dates in mind, you can visit David’s Vacation Club Rentals website, and use their “Cost Calculator” to see how much it would cost to book various resorts. One thing to remember is the price you see is the price (including tax) for the room, regardless of how many people are in your party. When you book a regular resort room with Disney, the price will change depending on how many people are in the room. Not so with renting points – it’s a flat rate for the room regardless of how many people are staying there. 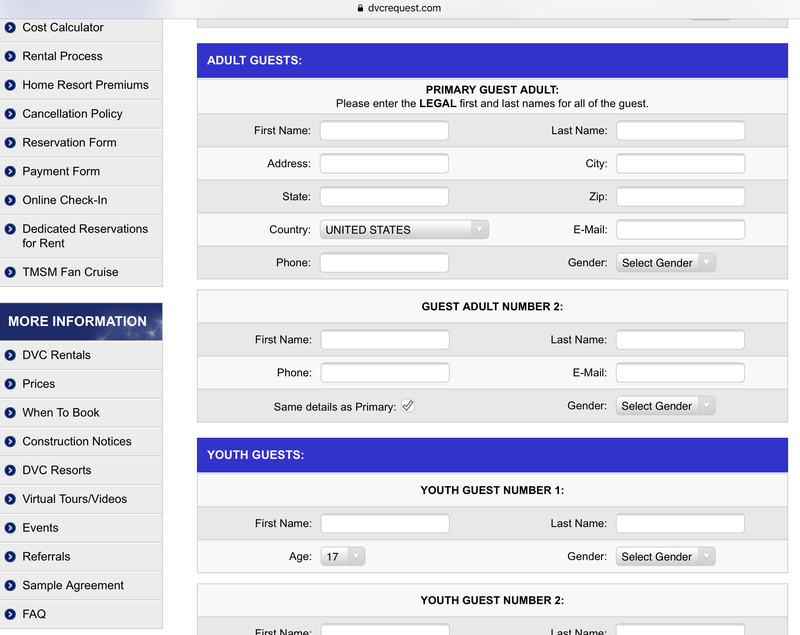 (Click on the “Check Occupancy” button on David’s website to see how many people each type of room accommodates.) So play around with the cost calculator to see what works for you. Just click on the dates you are interested in, and you can immediately see how much it will cost to stay at various resorts. 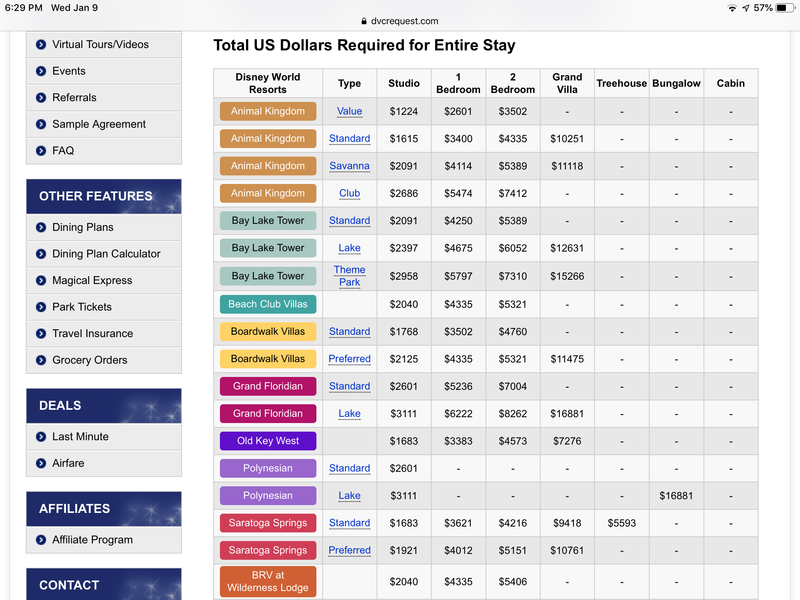 For example, as you can see from the screenshot, a 7-night stay from May 4-11, 2019 would cost $2091 for a savannah view studio at Animal Kingdom or for a standard view studio at Bay Lake Tower. Just for comparison, if you booked these same rooms on the Disney website, the price (for 4 people per room, including tax) with the current “Sun and Fun” offer would be $3894.21 for Animal Kingdom-Kidani or $4665.06 for Bay Lake Tower. If you wanted a standard view 1-Bedroom villa at BoardWalk, you could rent points for it from David’s for $3502 or book it directly with Disney for $4222.15. Diva Tip: THIS IS NOT A GUARANTEE THAT ROOMS ARE AVAILABLE!!! 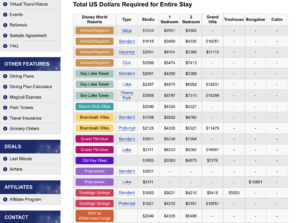 The cost-calculator merely lets you know how much each type of room at each resort would cost. You’ll need to submit a request to determine if a room is actually available. The sooner you do this before your travel dates, the more likely you will be able to secure an available room. I love playing with the cost calculator, because it is an easy and quick way to see which resorts are within our budget. And, if your dates are flexible, its super easy to plug in different dates and immediately see which time-frame is more economical. Submit a request Once you decide on a resort and date, the next step is to submit a request to see if a room is available. This is the part that makes us hold our breath each time – you’re all excited and ready to book, but you don’t know for sure if your choice is available until you submit the request. To submit your request, you just need to complete the online form. 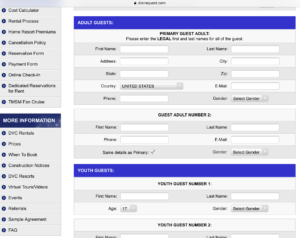 You’ll need to specify your travel dates, resort/room category choice (including any alternate choices you may have), and details of your travel party (name, phone, email). You will also need to make a partial payment of $119 via Visa, Mastercard or Paypal. It’s important to note this $119 will be applied to your room payment AS LONG AS DAVID’S CAN FULFILL YOUR REQUEST. Once you submit all this information, you cross your fingers and wish for pixie dust. IF David’s can fulfill your request (or one of your alternates, in the order you prioritized your choices) they will send you an email confirmation within a day or so and you can start packing your bags! You can go online and see your reservation details in your My Disney Experience account. You will also need to pay for the reservation IN FULL IMMEDIATELY. This is one downside to renting points as opposed to booking a room directly from Disney – payment is due in full at the time of booking. It’s also important to know that if you do not make the payment, your $119 will be forfeited. There are NO REFUNDS for any request which David’s was able to fulfill. So think carefully before you submit a request! Diva Tip: Since there are no refunds once a request has been fulfilled, David’s recommends (and I absolutely concur!) purchasing travel insurance. We always purchase travel insurance when we rent points. Life happens. You never know how circumstances could change, and no one wants to lose thousands of dollars. If David’s is unable to satisfy your request, they will let you know what choices are available, and if you don’t like any of those choices, your $119 is REFUNDED. So really, there’s no risk in submitting a form and seeing if your choice is available, as long as you are certain you’re willing to accept the reservation if it is available. One time our choice wasn’t available, but David’s offered to let us be on a waiting list. Within a 3-4 weeks, our choice became available and we got our room! I wasn’t quite sure if we wanted to wait it out, but through their online chat feature I was able to talk with the helpful employees at David’s about options and likelihood of getting our reservation. I relied on their advice, and they were right! So once you have a reservation, and your bank account recovers from making that payment in full, what’s next? Everything you would expect when making any other “usual” Disney resort reservation. You can still use Magical Express (although you submit your information to David’s, and they pass it on to the DVC owner whose points you’ve rented to secure your Magical Express reservation). It will still show up in your My Disney Experience account, so you’ll know your Magical Express ride has been secured. You can purchase park tickets and link them to your reservation. When you’re 60 days from arrival, you can make FastPass+ reservations. You will receive Magic Bands just like you would for any other resort reservation. For all practical purposes, a Disney vacation paid for by renting points is really no different than one paid for by booking directly. You will need to do a little paperwork (all electronically – so really convenient!) and pay the entire cost upfront. But in return for that, you are able to stay at a deluxe resort at sometimes less than half the price! Remember the example above? Renting points would cost $2091 for a savannah view studio at Animal Kingdom-Kidani or a standard view studio at Bay Lake Tower. A Little Mermaid room at Art of Animation (a value resort) for those same dates costs $1,724.65. For our hypothetical party of 4, that’s only about $13 more per person/per night to stay at a deluxe resort! Is it worth that to be at a deluxe resort with more floor space, nicer amenities and the chance to have breakfast with giraffes on your balcony, or to be within walking distance from Magic Kingdom? For us, it is. We have been very impressed with our experience in renting points and will not hesitate to do so again. I should note that my comments are reflective of my actual, honest experiences, and I have not been compensated in any way by David’s Vacation Club Rentals for my review. How the Disney Deluxe Dining Plan Saved Me Over $600!